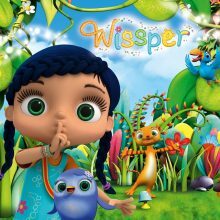 The fantastic TV show ‘Wissper’ has added Loud and Clear’s animation supremo Nigel Pilkington to it’s 2nd series airing at 6.40am every weekday morning on Channel 5. Wissper is a 7-year-old girl, born with the magical ability to whisper to animals. She has a loving connection to all creatures. By using the magic word “Sssshhh!…” she can transport herself to anywhere there is an animal in trouble. Wissper is sweet natured, except when animals are behaving badly. Nigel is expertly voicing the role of Monty Meerkat, Frank Flamingo, Pablo Penguin, Herbert Horse and others in this brilliant kids TV show.